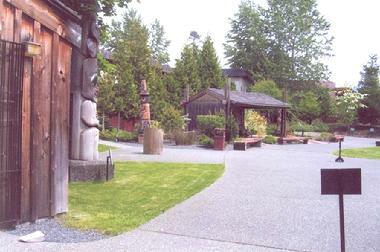 The Quw’utsun’ Cultural and Conference Centre is owned and operated by the Cowichan Tribes Indian Band, and has been in operation since 1989. The QCCC was established as an entry-level training facility for the Cowichan tribe’s people with aims at developing hands on training and skills in the tourist and hospitality trades. The centre is located on 3 acres of landscaped traditional fishing grounds along the banks of the Cowichan River, and is maintained and operated with various direct and indirect Government funding. The Quw’utsun’ Cultural and Conference Centre offers a tourist oriented experience with interpretive tours, commercialized artwork, salmon barbeques, displays, and visual demonstrations.